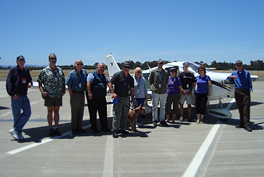 The AAC has always been a not-for-profit club dedicated to making flying accessible and affordable to everyone. We are based at Oakland International Airport (KOAK) in the San Francisco Bay Area of Northern California, and we welcome new members from anywhere in the Bay Area — and from all walks of life! The AAC was formed in the 1980’s at (the now-closed) NAS Alameda near Oakland, and the club moved to its current location at Oakland Airport over ten years ago. We have our headquarters in one of the hangars at the “Old T’s” on Oakland’s North Field. We have about 100 members, 3 Cessna 172s, a Piper Warrior and a Piper Arrow. We rely solely on member dues and rental income from the planes to keep us financially solvent, and also rely on our members’ voluntary work to keep the club organized and working efficiently. We are safety-conscious and keep our planes professionally-maintained at all times. Membership in the Alameda Aero Club offers student or experienced pilots more of what they are looking for in a flying club. As a member, you are a part owner of the aircraft. You enjoy 24 hour access to all the planes via our convenient, web-based reservation system. In close proximity to San Francisco and East Bay cities, Oakland International serves as a convenient airport for both your ground transportation and flying needs. Student pilot training in the Oakland area is more thorough, given the diversity of terrain, airspace, and airport setting. The club holds general meetings roughly every two months at Oakland airport; these are open to the public and visitors are welcome! If you’re interested in joining the club, please see our Join Our Club page! As volunteer owners of the Alameda Aero Club, we pride ourselves in providing our members with all the “bells and whistles” found in more expensive, larger clubs. Our automated, web-based reservation system allows you to check schedules and reserve planes from home, using our Aircraft Booking System. $250 Refundable deposit, $250 Initiation fee and $40 first month’s dues for a total initial payment of $540. That’s it. Monthly dues continue to be $40 per month. Family members or other general aviation enthusiasts are welcome to join for $5.00 a month; inactive (temporarily non-flying) members pay $10 per month. No mandatory assessments for cancellation due to bad weather etc… Just a phone call. So what are you waiting for? Our club now offers gift certificates. Please contact the Chief Pilot to purchase. 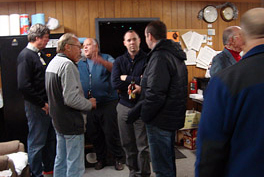 The club has several FAA-certified instructors on hand, available to help you with all your training needs. Whether you’re just starting out, adding an IFR ticket, or going for an ATP, our instructors will provide you with thorough, competent training. 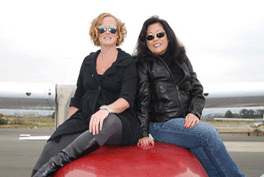 Call or email for an introductory flight lesson. As a member of the Alameda Aero Club, during the first 24 hours you have a plane, you only pay for the hours the airplane is actually flown. This includes weekends and holidays. Unlike other clubs, a full day is defined as just that–a full day. Minimum flight time after the first 24 hours is just 2 hours a day. The club is always looking for good aircraft for leaseback arrangements — download our leaseback terms for a description, or get in contact with the club President or Chief Pilot. Our terms are that you, as an active member, are provided with a safe, reliable airplane when you want it. Further, that flying your airplane doesn’t empty your wallet in learning to fly or gaining an advanced rating. All aircraft are maintained by a dedicated maintenance manager and a team of plane captains who set the highest standards for aircraft safety and reliability. Our membership cares equally about the cleanliness and well-being of their planes. We maintain a comprehensive insurance plan for both in-motion and not in-motion accidents. The club’s formal rules are spelled out in our Club Rules page and the Bylaws page. Check out our Join Our Club page, or for more information, please email our membership officer or call the club at (510) 454 9945.